If your roses are displaying black spots and yellow leaves, the plants are infected with a fungal disease called black spot. Though the disease is referred to as black spot, other symptoms of the underlying problem, like yellowing of leaves, become apparent. For healthy roses, choose resistant varieties and maintain vigorous plants to decrease vulnerability to infection. Black spot disease is a fungal infection of roses caused by the fungus Diplocarpon rosae. The fungi spread sporadically from previously infected plant parts. When plants are irrigated from rain or sprinklers, the spores are transported to unaffected plants. For successful infection, the fungi need a moist environment that remains wet for a minimum of three hours, according to the Mississippi Agricultural and Forestry Experiment Station. This fungal disease tolerates warm and cold temperatures and will proliferate provided the environment remains moist. Late in the spring, roses develop tiny dark brown to black spots on leaf surfaces with edges that may begin to blur or that turn yellow; the spots grow up to 1/2 inch in diameter. Spots usually appear first in the lower regions of the rose plant and ascend the plant as the disease progresses. In severe black spot infections, leaves turn yellow, die and fall from the plant. Repeated infections result in cosmetically damaged foliage, fewer blooms and eventual death. Keep your roses vigorous through proper care. Roses thrive in full sunlight with a minimum of 6 hours of direct sunlight a day, preferably in the morning. Earlier daily sun exposure helps dry up remaining water like dew that leaves roses highly susceptible to fungal infection. Plant roses in well-drained, loose soil for adequate drainage of moisture. Planting resistant rose varieties does not mean your roses will be immune to black spot, but it decreases the likelihood. 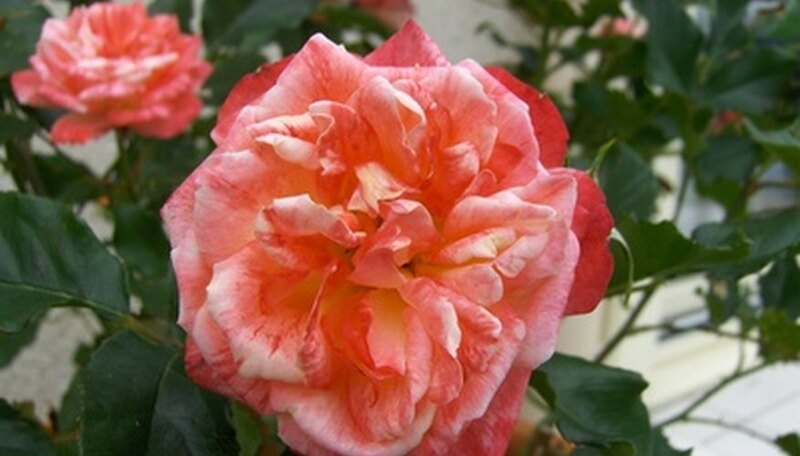 Plant grandiflora roses or floribunda roses before you plant hybrid tea roses, according to the Mississippi Agricultural and Forestry Experiment Station. Levels of resistance vary among roses, but hybrid teas are much more susceptible than other varieties. Contact a local extension agent to determine which roses are particularly resistant in your region. Always avoid overhead irrigation, as this type of moisture increases leaf wetness and provides an ideal environment for fungi. Remove and destroy affected or fallen plant parts to prevent the spread of disease. Always sanitize pruning tools between cuttings and from plant to plant to further prevent disease transfer. If you know your rose variety is susceptible to black spot, maintain full-season control methods. First, apply a fungicide for black spot to roses in the spring before leaf growth; apply fungicides every one to two weeks during the entire summer season, continuing until first frost occurs, according to the Purdue University Extension. Black spot fungicides include but are not limited to azoxystrobin, trifloxystrobin, triflorine, chlorothalonil and mancozeb.